The private spaceflight partnership PlanetSpace-Canadian Arrow announced plans to build the Silver Dart spacecraft, an orbital vehicle designed to launch eight people into space. A spacetourism group developing a suborbital rocket ship is now taking aim at orbitaltrips with a new spacecraft that doubles as a hypersonic glider. Canada's London,Ontario-based firm PlanetSpace unveiled designs forits SilverDart spacecraft, an eight-personvehicle derived from experimental aircraft studies in the 1970s, Thursdaywith hopes of carrying fare-paying passengers into orbit and resupplying the International Space Station (ISS). "The SilverDart is the DC-3 of the space industry," said Geoff Sheerin,PlanetSpace president and CEO, in a telephoneinterview. "It has so many things going for it in terms of performance." Sheerin'sSilver Dart program is separate from his Canadian Arrow effort to use a provenV2 rocket design to build a three-person rocket ship for suborbital flights.Plans for the Silver Dart date back about four years as Sheerinwas researching the Canadian Arrow rocket to compete in the $10 million Ansari X Prize competition for suborbital spaceflight. "About fivepercent of my time has been looking and poring over the program," Sheerin said of the Silver Dart plans. But NASA'sintention to purchase commercialservices for both cargo and crew flights to the ISS encouraged Sheerin and his team to push forward with their work. NASAplans to retire its three remaining space shuttles - Atlantis, Endeavour andDiscovery - in 2010. 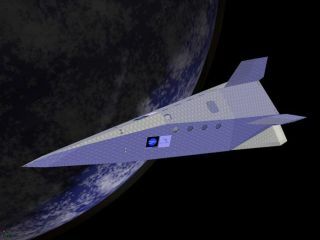 Based onthe U.S. Air Force's Flight Dynamics Laboratory-7 (FDL-7) program, the SilverDart is a lifting body designed to glide from hypersonic speeds of Mach 22 downto landing, PlanetSpace officials said. The spacecraftis expected to launch vertical atop a stack of about 10 Canadian Arrow rocketengines and landhorizontally on an aircraft runway, they added. The firstSilver Dart spaceflight is expected follow the inaugural manned Canadian Arrowlaunches, the first of which is slated for 2008 with four more to follow, Sheerin said. "You wantto have a multitude of vehicles," said PlanetSpacechairman Chrinjeev Kathuria. "With the CanadianArrow, you'd want to enter the [spaceflight] market very quickly. The secondstage is the Silver Dart." NASA basedits X-24B test aircraft on the FDL-7 lifting body and valued the added rangeand stability the sleek, sharp-nosed design, according to documentation fromthe space agency's Dryden Flight Research Facility in California. Paul Cyzsz, an engineer who worked on the original FDL-7 effortand is guiding PlanetSpace's Silver Dart work, saidthe new spacecraft would use a 1960-1970s era shell wrapped around a lighterinner body with updated, modern electronics. "Theadvantage of an all metal aircraft is that you can land in any kind ofweather," said Paul Cyzsz, adding that unlike NASA'sspace shuttle - which does not land in rain to prevent damage to its exterior. "You can't trap it in space, it can always get back tothe continental United States." Cyzszsaid the FDL-7's lifting body design would also give the Silver Dart abouttwice the lift coefficient as NASA's space shuttles at subsonic speeds. "We'recommitted to building the Silver Dart," Sheerin said,adding that he decided early on that his program needed the additionalperformance of a different space vehicle. "I really kind offeel in love with this concept."